Spot Spot Welding electrode for portable welder. 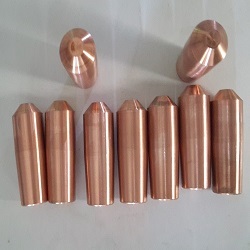 PARENTNashik offers spot welding electrodes tips in different shape, style with threaded, taper as per international standards made in Chromium copper zirconium |C-18150 | group-A| for spot welding gun, portable welder & robot gun. PARENTNashik Electrodes types – Cap tip, straight, bend, threaded – screwed, composite, crank, swivel, nut & stud, projection, tungsten & tungsten copper faced. #Quick Delivery #Best Price #Excellent Quality. I like that you mention how important it is to have the right electrode. My brother is looking to get some spot welding done but needs tips. I’ll be sure to talk to him about finding a professional who knows which electrode to use. Thanks dear ! I’d be happy to if you can ask your brother to send details what is required.